The root cause for knowing everything, for jIvAthmA, at the time of attaining liberation, is blossoming of knowledge. AzhwAr mentions how he got that and brings this prabandham to its end. iniyaRindhEn IsaRkum nAnmugaRkum dheyvam – I have now seen that you are the Lord for Siva, who is famously known as Isan (one who controls) and brahmA, who has four heads. I have seen now something which I had known only through SAsthras (sacred texts). In any literary composition, since there is a rule that the beginning and end should be congruent, AzhwAr speaks about the same context that he had started with in the first pAsuram “nAnmuganai nArAyaNan padaiththAn nAnmuganum thAn mugamAy sankaranaiththAn padaiththAn ” (nArAyaNa created brahmA and brahmA, with nArAyaNa as his indwelling soul, created siva). iniyaRindhEn emperumAn unnai – now I have seen you, as you are, directly. kAraNan nI – I knew that you are the causative entity for all the universe. kaRRavai nI kaRpavai nI – whatever entities I have known before and now, after having my knowledge blossomed (due to your grace), whatever entities I will know in future, are all following your commands. naRkirisai nAraNan nI – I knew that you are nArAyaNa, carrying out the great deed of protecting all, without any reason, and that you are the lord of all. 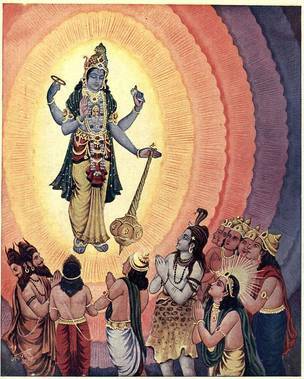 nAraNan – one who has the quality of being the lord for all entities which cannot be obliterated. Haven’t you known this before? nangaRindhEn nAn – while I had the knowledge about this through SAsthram (sacred texts) now I have known this well, by seeing it directly. This brings us to the end of this prabandham. This entry was posted in iyaRpA, nAnmugan thiruvandhAdhi on October 1, 2018 by T N Krishnan.